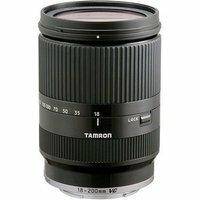 The Tamron 18-200mm f3.5-6.3 Di-III VC in black is an all-in-one zoom lens designed for the Canon EOS M compact system camera. With a minimum focus distance of 45cm, this lightweight zoom lens is great for close-up photography and uses a stepping motor to ensure quiet and quick focusing so your subject is not disturbed. This wide high-power zoom features VC image stabilisation which provides up to a four-stop anti-shake advantage when you're shooting handheld, so you can make full use of the lens's capabilities even in low light. Direct Manual Focus (DMF) allows you to make delicate adjustments to the image and precisely focus the image exactly the way you want it to look.